Oh, Summer! This season of mangoes and high buns is not just giving us suntans but some interior goals as well. While summer brings a gallon of inspiration with a bundle of wallpapers and fabrics, you ought to reset your space with some of these. We’ve been busy putting together some inspiring storyboards combining some of our favorite fabric and wallpaper pieces to inspire your April decor schemes. The most popular trend for summer 2018 is an explosion of color with strong, oversized prints. Imagine coming home each night to a peaceful, exotic retreat full of prints inspired by nature, made up of leaf motifs and a rich green color spectrum. Shades of blue and green will continue to weave its way into our hearts, fashion and home as we yearn for a planet that is greener and healthier. On the other hand, use of saturated color in interiors is an important trend. It’s equally exciting to mix contemporary patterns with bright hues to aesthetically express nature’s beauty. For example, you can incorporate tropical patterns with solid colors like reds and whites, picking up elements from the checkered wallpaper. 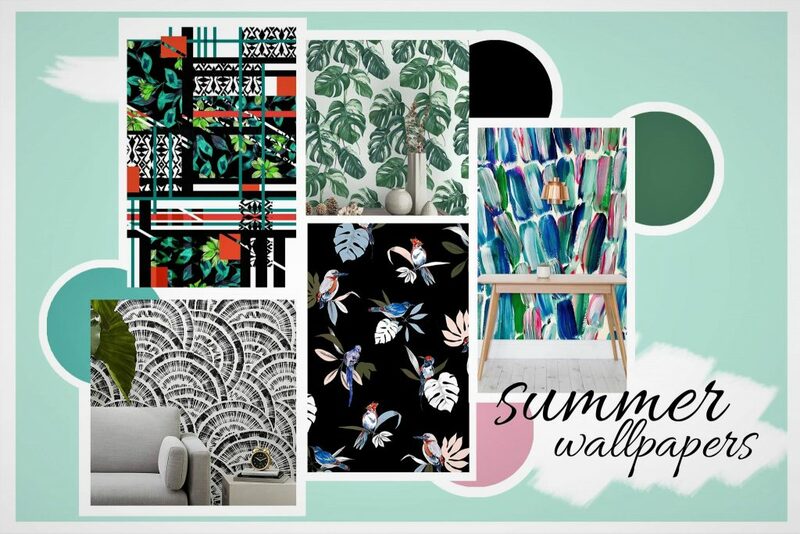 There is a huge range out there at the moment, from quirky birds sitting on leaves to dramatic black and white prints like caressing the sand, more sophisticated botanical themed like montsera, banana or palm leaves on wallpapers, accessories, and furniture. Or for a more India Hicks vibe, bring nature indoors with organic colors, textures, and forms with wicker, cane and linens. Beautify your corners with fabrics built for the heat and flaunt designs that are edgy and neat. After so many seasons of neutrals and greys, it is exciting to see textiles combined with a contemporary appeal of strong colors like indigo blue, avocado green and mustard yellow. 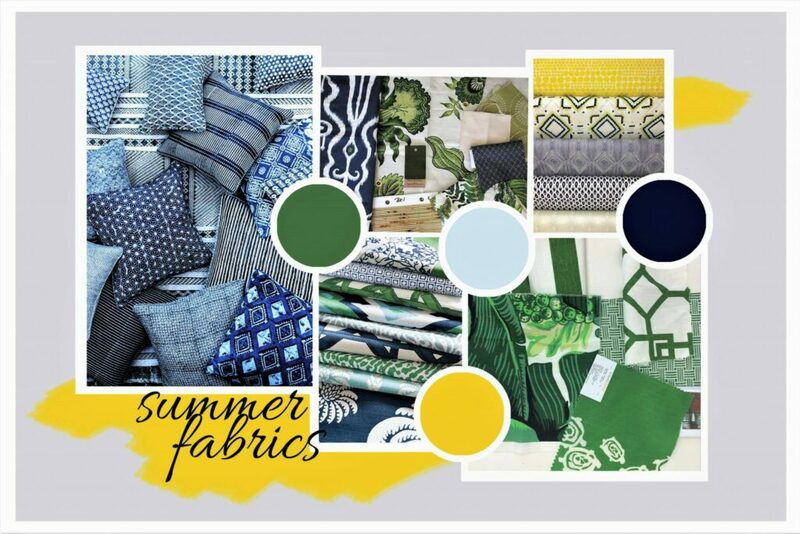 Trends on our radar include seeing the influx of tropical decor in fabrics that has grown into an increasingly popular trend this summer. There is a strong emphasis on striking lush prints in zesty lime and ocean tones. This features patterns made up of dots, diamonds, stripes, and squares to give a tropical feel with a sophisticated edge. Come home after a busy day and feel comforted in a luxurious environment. The floral and leaf motifs are conquering seamlessly with all other styles and ideas alive. Everyone can find something that fits their mood and character. Get serious about the hue Sage as well. It’s set to be the neutral du jour of 2018. These natural prints are no doubt easy to decorate with but don’t veer into boring or predictable. Are you ready to bring the Summer into your home? !